* Inherited: parents that have mutations can pass them to their offspring. * Germ line mutations: are present in every cell of an individual, including the egg or sperm used in the production of offspring. * De novo (new) mutations: occur by chance in one or a few eggs or sperm, or just after fertilization, and are NOT present in every cell of a parent. These explain situations where a child has a genetic disorder that is unseen in the family history. * Acquired: environmental agents, called mutagens, can alter DNA. An example of a common mutagen are the UV wavelengths in sunlight associated with skin cancer (see image). Acquired mutations are typically not passed to offspring but can be if they alter DNA sequences in egg or sperm. 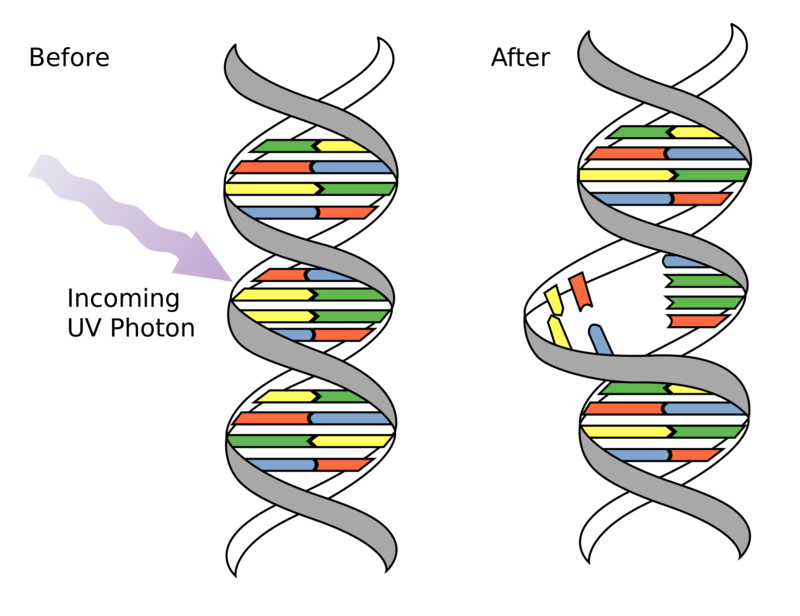 * Insertion/Duplication/Deletion: the addition or subtraction of nucleotides from DNA sequence. They can be as small as single nucleotides or large enough to visualize on a chromosome and involve tens to hundreds of thousands of nucleotides. * Point Mutation: the change in one nucleotide for another. For example, an “A” becomes a “T”. * Translocation: the movement of a segment of DNA from one chromosome to another. 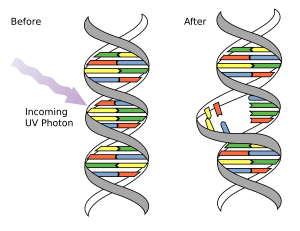 * Inversion: the 180° flip of a DNA segment so that that it is reversed compared to the original structure. Ultimately whether or not a particular mutation causes a detrimental effect is due to the location of the mutation within a gene (or genes) as well as the significance of that gene’s function.